Investors have always been interested in stocks that pay dividends, but lately, low interest rates on bonds and other fixed-income investments have made solid dividend payers even more valuable. Among the most promising dividend stocks in the market is Walgreen , and one big reason is that it is one of the few exclusive companies to make the list of Dividend Aristocrats. 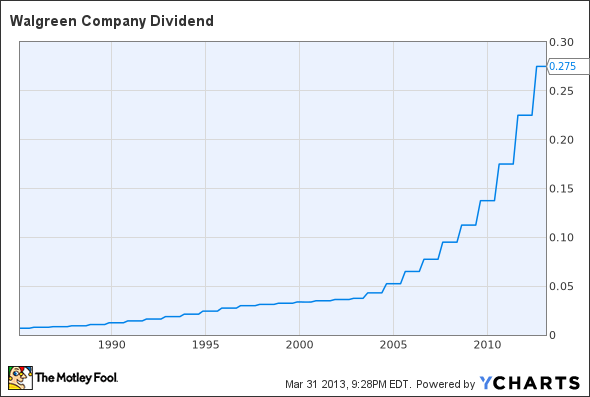 In order to become a member of this elite group, a company must have raised its dividend payouts to shareholders every single year for at least a quarter-century. Only a few dozen stocks manage to make the cut, and those that do tend to stay there for a long time. Walgreen has had its share of ups and downs over the past year, but things are starting to look up for the drugstore giant. Let's take a closer look at Walgreen to see whether it can sustain its long streak of rewarding dividend payouts to investors. Walgreen suffered a lot during 2012, as its dispute with pharmacy benefits manager Express Scripts led to an exodus of customers to rival drugstore chains. Even after Walgreen and Express Scripts came to a resolution, Walgreen has had a tough time bringing those customers back. WAG Dividend data by YCharts. Moreover, Walgreen has taken some big steps to bolster growth. Its purchase of a 45% stake in Europe's Alliance Boots drug chain last summer was part of its larger strategy to expand across the globe as it seeks to diversify and take advantage of better growth opportunities abroad. More recently, Walgreen's move to replace Cardinal Health as its drug distributor in favor of a 10-year agreement with rival AmerisourceBergen will enhance its global distribution capacity, and Walgreen and Alliance will take an equity position in AmerisourceBergen as well to cement the partnership. When will dividends rise again? Last year, Walgreen raised its dividend during the spring, so investors should prepare for another increase in the near future. What's more important in the long run, though, is whether its major strategic moves will lead to a return to stronger growth. If so, then Walgreen should remain a Dividend Aristocrat for a long, long time. Walgreen's dispute with Express Scripts shows just how important pharmacy-benefits management has become in a health care landscape dominated by searching for ways to control costs. Find out how Express Scripts is part of the solution by reading our premium research report on the company, where we clearly lay out the opportunity in front of this misunderstood stock. Claim your copy by clicking here now. Click here to add Walgreen to My Watchlist, which can find all of our Foolish analysis on it and all your other stocks. The article Why Walgreen Is a Top Dividend Stock originally appeared on Fool.com. Fool contributor Dan Caplinger has no position in any stocks mentioned. You can follow him on Twitter @DanCaplinger. The Motley Fool recommends Express Scripts. The Motley Fool owns shares of Express Scripts. Try any of our Foolish newsletter services free for 30 days. We Fools may not all hold the same opinions, but we all believe that considering a diverse range of insights makes us better investors. The Motley Fool has a disclosure policy.